How are we at the end of the holidays already? 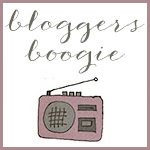 It’s been fun, thanks to everyone who has joined in the resurrected Bloggers Boogie over the last few weeks. Time to celebrate the end of holidays and the long weekend, and take the boogie out with a bang! Blog up to five songs. Any theme, or no theme. One video or five. Come link up in the comments, from 9am AEDST Saturday until 5pm AEDST Monday. Pop around and enjoy the tunes! It’s that easy. Not a blogger? Feel free to post your songs in the comments section here, on the Little White Dove Facebook page, or if you are a ThisIsMyJam or 8tracks user, link up with that profile! Heck, tweet me @thedovenest with your boogie! This week is just a random assortment of songs I’ve been loving this week. This mashup is possibly the coolest thing I’ve heard all year. And maybe last year too. What have you been listening to this week? Hook me up with some cool stuff to check out! Have a great long weekend everyone. Love the mash up it is so cool! !